Early this summer I purchased my first electric bicycle, the Ness Icon and I’ve been riding it for several months and so far it has held up well, performed without a glitch, and easily achieved a 30+ mile range on a single charge. The Icon is very similar to the Ness Rua. The only significant difference is frame style but pretty much all the other specs are the same so this review will be a good look at the Rua as well. 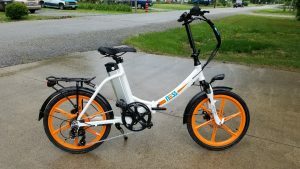 Having an electric bike has provided the opportunity for me to ride more often and go farther distances and that was the whole point of choosing an electric bicycle. I’ll get into some of the pros and cons of a folding bike but overall, I’m very happy with the purchase and the quality of the Icon. For some this might seem like a silly question but for many of us new to e-bikes we might be wondering how exactly electric bikes work. 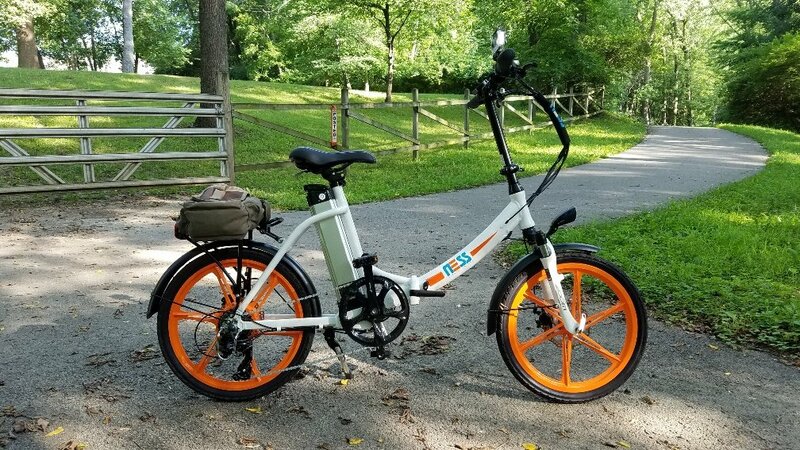 There are different setups for electric bicycles but most of them have a motor in the rear wheel that offers different levels of pedal assist and a full throttle option which allows you to not have to pedal at all. The Ness Icon has a 350-watt motor and 5 levels of pedal assist that are set by choosing whatever level preferred through the onboard computerized control mounted on the handle bars. The pedal assist kicks in when the sensors located near the pedal assembly sense that you are pedaling the bicycle. Some of the cheaper electric bikes are less sensitive to knowing when a rider has begun pedaling and others are quite fast, meaning that there’s a very small delay from the first pedal movement till when the motor kicks in. The Icon is quite fast with a minimal delay. Also, some bikes can be a bit herky jerky taking off from a dead stop but the Icon is fairly smooth but if you’re new to electric bicycles, it does take a little getting used to and more on that in a bit. Also, electric bicycles require a battery and some are mounted inside the frame, some are on the back rack, and others like the Icon are located behind the seat post. An advantage to having the battery located in the middle of the bike is that it is balanced better and the battery is usually easier to remove. A key is used to lock the battery so it can’t be removed without the key and the same key is also used to turn the battery on and off. Advantages to having the battery inside the frame is that it protects the battery more and may hide the fact that it is an electric bike. It might give a more streamlined look to it too. Batteries mounted on the back obviously put more weight on the back wheel and the weight might not be distributed as well for riding purposes but it depends how large and heavy the battery is. Most electric bikes also have a throttle. Some are thumb shifters and others are twist controls. The Icon uses a twist control. When using the throttle, you don’t have to be pedaling in order to get the motor powering the bike. You can ride the bike like you would any motorized bike or ATV, etc., and just sit back and let the motor do the work. With the Ness Icon and Rua whatever level of pedal assist you have set will be the amount of power the throttle will provide. Using only the throttle will use the most power so I generally use it sparingly. 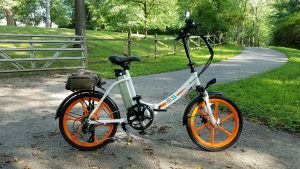 Why Get a Folding E-Bike? For me, the main reason why I chose a folding electric bicycle was to accommodate my height. Unfortunately, most of the full-size e-bikes have standard sized frames that might be too tall for shorter riders. Even some of the folding bikes aren’t the best for short riders either and I’d recommend checking out the guide I put together when I was choosing a folding bike to select the one that will best accommodate your height and weight. A big reason to choose a folding e-bike is to ability to transport it in nearly any vehicle. They’re great for campers or even to put into the back of a small SUV. One thing you want to be careful about is the weight of an e-bike. Just because it’s folding and smaller doesn’t mean it’s lightweight. The Ness Icon is around 51 lbs and I would have a hard time getting it into the back of my SUV by myself. However, removing the battery will reduce the weight by close to 10 lbs or so, making it more manageable to lift in and out of a trunk. Folding e-bikes are also great for city commuters that want to bring their bike inside an apartment or even their workplace but just know that they aren’t feather light to carry up stairs. With that out of the way, let’s get to the Ness Icon specifically. What are the specs? How well does it ride? What kind of power does it have? 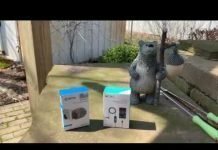 How long does the battery last? The Ness Icon is equipped with mag wheels which are more durable than spoke wheels but does result in a stiffer ride. However, I was glad that I had those mag wheels when a stick got stuck in one while I was riding it. The wheel broke the stick in half instead of breaking spokes. Also, an advantage of mag wheels is that they require no adjusting and it would be really hard to bend the rim out of shape. I’m not saying it isn’t possible but they’re pretty strong. Then again, the trade off is a more jarring ride. Because of that I would recommend investing in a suspension seat post and/or a seat that can absorb bumps better. The seat that comes with the Ness Icon is actually good and if matched up with a suspension post would probably be comfortable. The seat tilts up for easy accessibility to the battery. I switched out the seat on mine to a more padded seat with some built-in suspension. It’s fine. I can ride the bike for 15 miles comfortably. I might upgrade to a suspension post later if I can find one that won’t make the seat post too high. If you’re of average height, probably 5’4″ to 6′, you’ll probably be able to find a good suspension post to give a good ride. Us shorties might have to shop around a bit. The Icon does have front suspension forks that are adjustable and they seem to work well and absorb a lot of the shock. Just know that folding bikes usually have a stiffer ride to them than full-size bikes, although some have quite a bit of suspension built in. Whether or not the 350-watt motor will provide enough power for your rides depends upon your weight and the terrain you’ll be riding on. 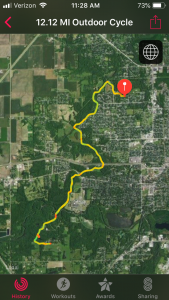 I weigh about 145 pounds and it has no trouble pulling me up hills but I live in Central Illinois where the hills generally aren’t numerous or steep. Still, the bike path I frequently ride does have quite a few hills and with pedal assist I’m able to go up them without any trouble. If I were to just use the throttle, it would struggle more. It still gets me up the hill but it’s best to use the pedal assist. 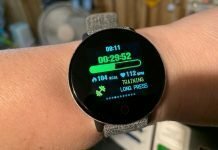 For one, using pedal assist uses less battery and also you’re still getting a good workout and you can choose how much of a workout you want depending upon what level of assist has been selected. The bike can be ridden without any pedal assist. It has 7 gears and I typically ride in the 6th gear. I also typically have it in pedal assist level 1 or 2, occasionally 3 and very rarely higher than that. There is one long fairly steep hill that I have to ride up and it’s the only one that I’ve used level 5 on and that’s mostly because it’s on a road where visibility isn’t the best for drivers and I don’t want to hang out on it longer than I have to for fear of getting run over! So I kick it up to the max and minimize the amount of time I spend on that stretch of road. It will use more power on higher levels of pedal assist, so keep that in mind. Also, I try to conserve the battery when I’m riding to a destination so I’ll know I’ll have enough battery to get me back home, if I feel like I just want to use the throttle or higher levels of pedal assist. But I’ve never felt like I was going to run out of battery. There is a battery indicator on the computer and on the battery itself. The indicator on the computer can fluctuate a bit when in higher levels of pedal assist, meaning that when it’s level 3 or higher the battery indicator bar will show less battery and then when I put it in a lower level of pedal assist, the battery indicator will show more of a charge remaining. Typically, the indicator on the battery itself will show more of a charge remaining than the computer but not always. So far, I’ve never ran out of battery, and that’s going over 30 miles on a single charge. I just make sure I charge it up after I’ve ridden 30 miles or so just to be on the safe side. It would be preferable if a percentage displayed instead of just the 4 indicator bars. I’d like to know exactly how much is left and some electric bike computers do show this instead. Because this is a motorized bicycle, it takes a little getting used to. Learning how to balance the bike, (it is fairly heavy), and being comfortable with the takeoff took some time. You definitely want to get a lot of experience with it before taking it on difficult trails or busy roads. It takes time to get used to the controls and what level of pedal assist you’ll be most comfortable with, and what level(s) are best for certain conditions, and how to handle braking and turning. The first ride I took on the bike was just as a thunderstorm was rolling in. I knew I had a very short time to try it out, so I took it for a quick spin around the block and about halfway home a bolt of lightning struck nearby (okay not my shining moment of good decision making) and I put it into level 5 and used the full throttle which got me up to 20 mph. That’s about how fast the bike will go on just the throttle. I pulled into my driveway and forgot I still had it in level 5 and gave the pedal a half turn to get into the garage and well, I about wrecked the bike and sent myself to the ER. Luckily, the brakes are very good and stopped me. 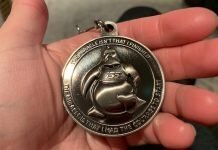 It was embarrassing but a good learning experience. Remember what level of pedal assist you’re in! Also, be aware of what level it is in when you are taking off. Whatever level it was in when you turned the computer off will be selected when you turn it back on. You don’t want to take off in level 5… at least I wouldn’t try it. As a safety feature, the Ness Icon does turn off the motor when the brakes are used. 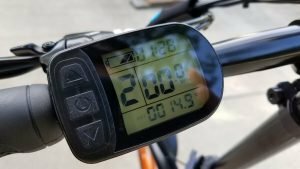 Not all electric bikes have this feature and I would recommend choosing one that does. This is good for parking the bike and sharp corners where you wouldn’t want to suddenly take off quickly. In other words, it is a motorized bicycle, not that different than a motorcycle. It doesn’t have the same power of course but many of the same principles apply. Also, since it is a heavier bike, learning to balance it will take some time. My regularly bicycle is very lightweight and easy to maneuver and coasts for long distances. A heavy electric bike won’t coast much. Most of the time you’ll need to be pedaling, unless you’re going downhill. I also found that the Icon doesn’t do well in gravel. This is a bike you want to stick to paved roads with. It would probably be fine on smooth and dry dirt trails but nothing with loose gravel or a lot of bumps. Besides upgrading to a better seat or seat post for comfort, there are other suggestions I have. The Ness Icon comes with quite a few essential accessories, like a back rack for carrying items, a good quality kickstand, chain guard (never had any issues with the chain so far), a metal bracket to protect the gear assembly in the back, and a metal bracket under the pedal assembly to set the bike on when folding and unfolding it. An accessory I would highly recommend is a mirror. Yeah, I prefer the looks of the bike without it but it’s so much safer riding to know what’s coming up behind you when on a road, or even a trail. Installing, the mirror was easy. There’s a plastic cap that can be easily popped out of the end of the handle grip to install a mirror. Another accessory I installed on the bike was a smartphone holder. I like to have my phone in front of me to quickly see who’s calling or even to use it as a GPS. Typically, I just use a smartwatch for that however. 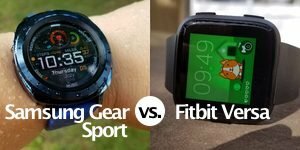 If you take a look around this site, you know I have access to very good GPS smartwatches. So, I guess that would be another accessory. 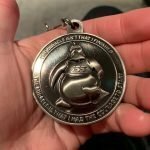 It’s not a necessary one but I think motivational. 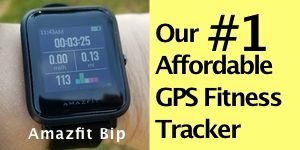 The bike computer does provide a distance estimate for your rides but a GPS watch can show more precise information and depending upon how capable the watch is, even show your coordinates, where you are on a map, your speed, cadence, and other data. 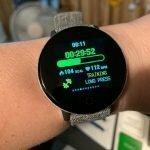 If you want a lot of data and mapping or breadcrumbing abilities, I’d recommend a higher end Garmin like the Fenix or Forerunner (see guide) but even the Vivoactive 3 (see on Amazon) will give you quite a few details. 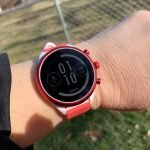 Suunto also makes some very good watches for cycling and even the Apple Watch Series 4 has tested out well for cycling. 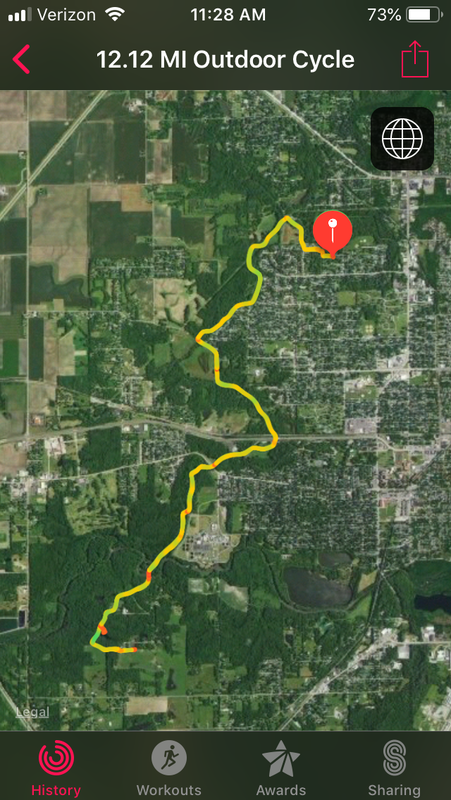 Below is a screenshot of a ride I took that the Apple Watch tracked for me. Another accessory I added was a pannier bag. I’d really recommend some sort of bag so you can carry important gear with you. Locks, air pumps, tire patch kits, snacks, a water bottle etc, are all good items to bring along. I also bring along my pepper spray gun and an alarm sounding device just in case I need it. Of course, the number one accessory is a bike helmet. This goes for any bike. As safety features, the Icon does have a headlight and taillight and the computer display has backlighting when the headlamp is on. The taillight requires separate batteries and a separate on/off switch but the headlamp is wired to the main battery of the bike. Just remember to turn off the rear light! I’ve forgotten more than once. Overall, I am very happy that I decided to get an electric bicycle. I was never comfortable with the idea of riding long distances on a regular bicycle due to health conditions. An electric bike gives me the assistance I need but also a good workout. I hope that they catch on in popularity in the United States like they have in Europe and elsewhere because they are an economical, environmentally friendly, and healthy way to commute. They’re also fun! As far as the Ness Icon goes, I can recommend it from my months of riding it. It hasn’t given me any issues thus far. The battery is made by Samsung and replaceable and the bike computer can also be replaced. 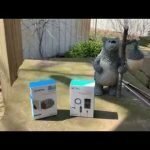 The batteries generally last about 3 years and cost around $300 or so. The Ness Icon also uses a fairly standard bike computer that can be replaced by a knowledgeable electric bicycle repair shop. I’m looking forward to getting the bike on the trail as the leaves turn this fall. 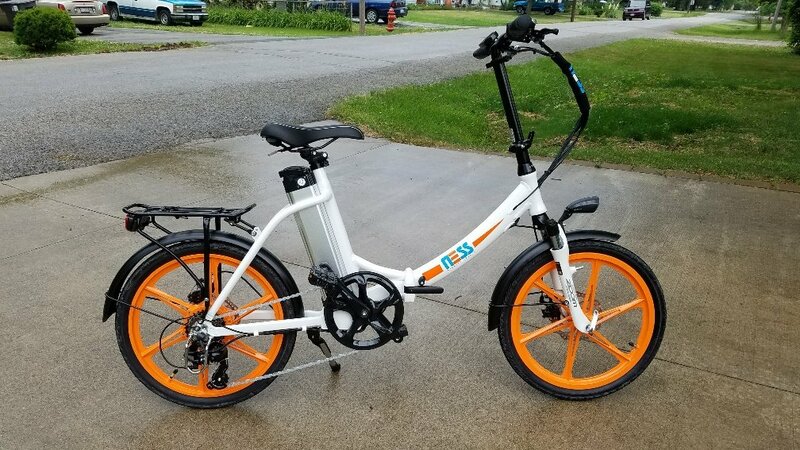 I never would have been able to ride the length of the bike trail through my town without an electric bike, and no it’s not cheating. It’s being smart! I still get a good workout but I still enjoy the ride. View or purchase the Ness Icon or Ness Rua on the Ness site. 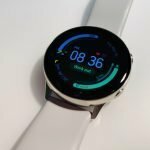 Previous articleNext On The List: The TicBand!